The second lesson in Oak Meadow grade 6 is on Ancient Medipotamia. We did a mix of their assignments and some I found inspiration for on Pintrest. We took several weeks on this lesson as MeMom came in for a 10 day visit. A's two favorite projects both took a great deal off time and required a lot of detail. Ancient Mesopotamians were a polytheistic society worshiping many gods. They built large temples called Ziggurats reaching high into the sky to be closer to their gods. 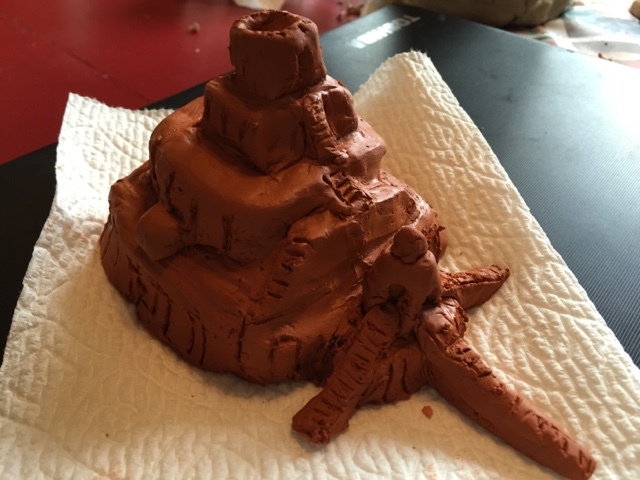 After studying these temples, A spent a lot of time creating a detailed replica from clay. I think she did a pretty awesome job! Our second major project of the unit took an extraordinary amount of time and concentration. 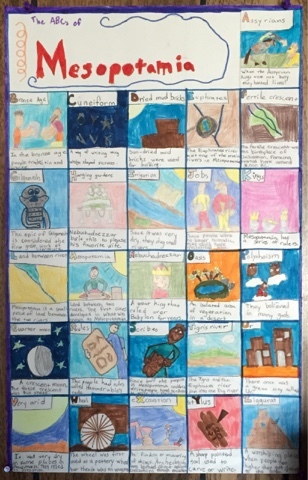 Her assignnment was to create an ABC poster of Mesopotamia. She first had to brainstorm and come up with a concept or item for each letter of the Alphabet. Then she had to create the poster, illustrating and writing about each concept. I drew the grid, but she did everything else. It is quite impressive and is now hanging in our school area! I am incredibly proud of the work and dedication she put into these projects. Hands on learning at its best. I love all your projects! Looks fantastic.